I clipped this recipe out of a Cooking Light magazine in March 1999 and finally made it in November 2013. I don’t know why this one took so long to get to, but I’m glad I held on to the recipe. The combination of figs and orange (orange juice + zest) make this especially delicious for breakfast. 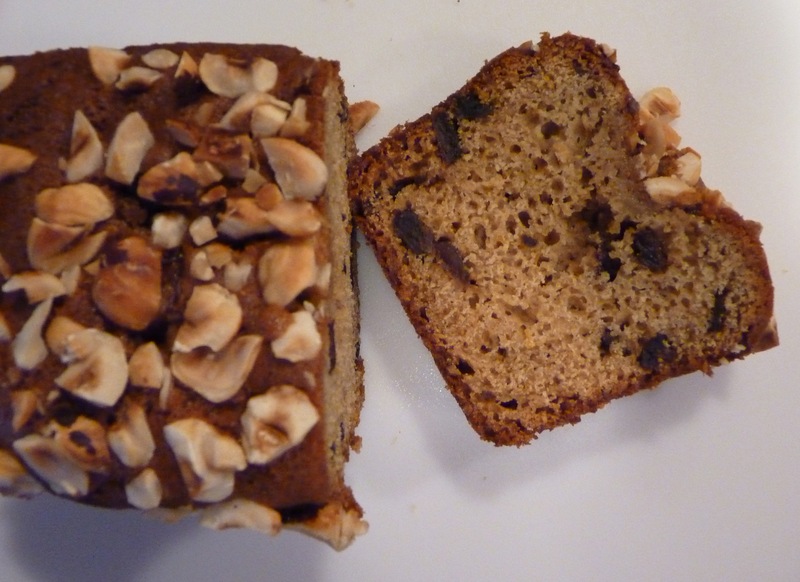 Unlike a lot of quick breads, the nuts are on top rather than mixed in. It’s nice to get a few really nutty bites along with some no-nut bites. It took a while to get to this recipe, but I won’t wait 14 years to make it again! I baked this in two mini loaf pans (5.75 x 3″) rather than in one pan. You can find the recipe here on My Recipes. An upside-down cake may sound daunting, but this is one is easy to make. The few extra minutes it takes to melt the brown sugar and layer the bananas on the bottom of the pan is more than made up for by the simple mix-by-hand cake batter. Surprisingly, this cake is low fat. I’m not going to call it health food, but I bake enough to know that 2 Tablespoons of butter, 1 1/2 eggs, and 1/2 cup of low-fat sour cream means that this is a heck of a lot less sinful than a lot of other cakes. But with caramelized bananas on top and chocolate chips throughout, you don’t feel like you’re missing out on anything. If you’re a banana lover, this is a must-try recipe! You can find the recipe here on David Lebovitz’s website. For the topping, he gives an option of water or butter – I used water. For the cake, he gives an option of regular or low-fat sour cream – I used low fat. There’s also an option for chopped chocolate or chocolate chips. I used regular-size chocolate chips. I don’t recommend using mini-chips or tiny pieces of chopped chocolate though – a substantial bite of chocolate really adds something to the texture and taste of the cake. I made the cake the day before and served it at room temperature. The recipe suggests serving it warm and adding whipped cream or ice cream, all of which sound wonderful. This dressing and I are going places. It was delicious on salad (as dressing should be), and was so good on a wrap sandwich with turkey and arugula. Next, I want to try it as a vegetable dip, and I bet it would be oh-so-good as a mayonnaise replacement in egg salad. I don’t make dressing often, but every time I do, I wonder why I don’t do it more often. This dressing is quick, easy, and delicious. 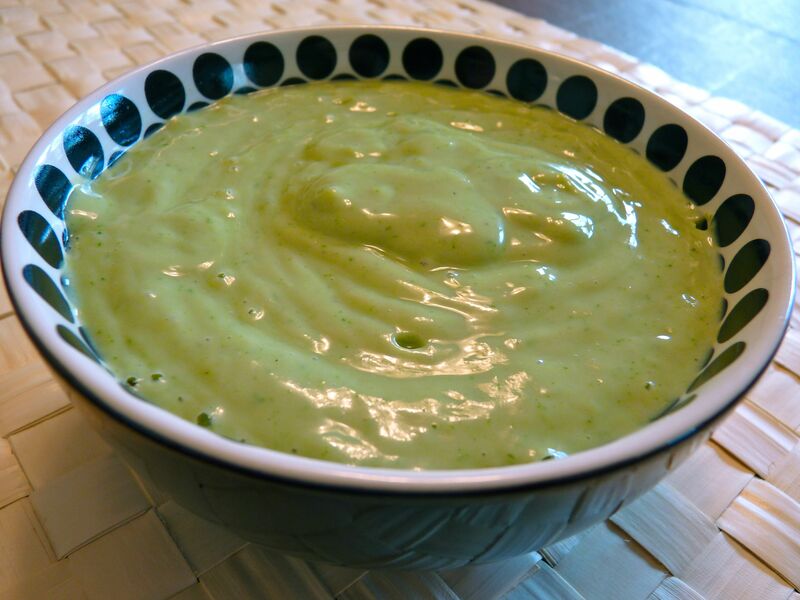 Buttermilk and avocado make it smooth and creamy; tarragon is the dominant flavor. What if you don’t like tarragon or don’t have any handy? Basil and chives sound like great candidates for this recipe. I will definitely be trying this recipe with other herbs that are on hand or are growing in my garden. You can find the recipe in The Food You Crave, or here on the Food Network’s website. The Craving Ellie In My Belly (CEIMB) group posts recipes on Fridays; check out the site to see what others made this week! Sausage has never been a favorite of mine, but after my recent trip to France, I had a change of heart. The friends we stayed with are big fans of Jamie Oliver, and one of the dinners we had was Proper Blokes’ Sausage Fusilli, from the Cook with Jamie cookbook. I was surprised by how much I enjoyed it. 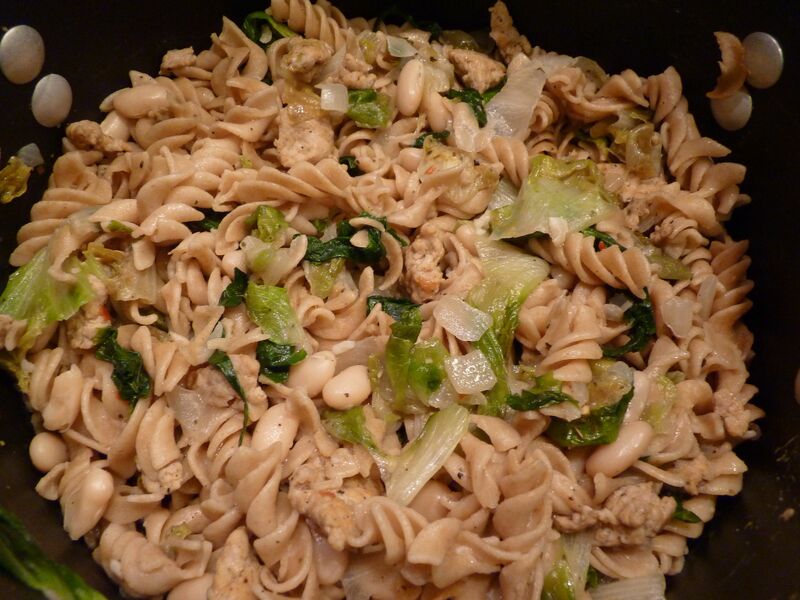 When I was back from the trip and looking for healthy recipes to cook, I came across Pasta with Escarole, White Beans, and Chicken Sausage in Ellie Krieger’s The Food You Crave. Perfect. I could try a sausage pasta recipe in a healthier version. I followed the recipe pretty closely, though I used dried sage instead of fresh. The combination of sausage, white beans, and escarole gave this dish a nice texture and flavor contrast. I’ve probably had escarole in salad blends before, but I had never bought a head of it or cooked with it. It’s crunchy and just a little bitter, and we enjoyed the leftover escarole in salads. The pasta reheated nicely too. When I was scooping out some leftovers I thought “how did a peanut get in there?” and then realized it was a white bean! This was really delicious, and definitely something I’ll make again. The only thing I’d change would be to use a little less pasta (maybe 8oz instead of 12 oz). This made a large quantity of food, and there was a lot of pasta in proportion to the other ingredients. You can find this recipe in The Food You Crave, or here on the Food Network’s website. The Craving Ellie In My Belly (CEIMB) group is now a “freedom of choice” group, meaning that you can cook whatever Ellie recipe you want. 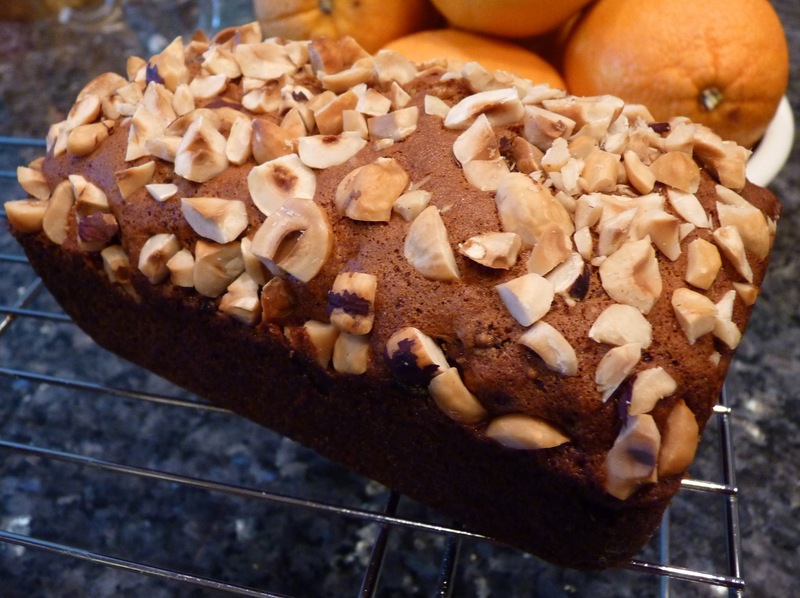 Each Friday, the CEIMB site will have a post where everyone can link to their recipes. I’ve made several of Ellie’s recipes and have liked them, so I hope that this group will inspire me to try more of her recipes and to use my cookbook a little more often! Happy new year! Here are a couple of delicious recipes I made for our new year’s eve at home. 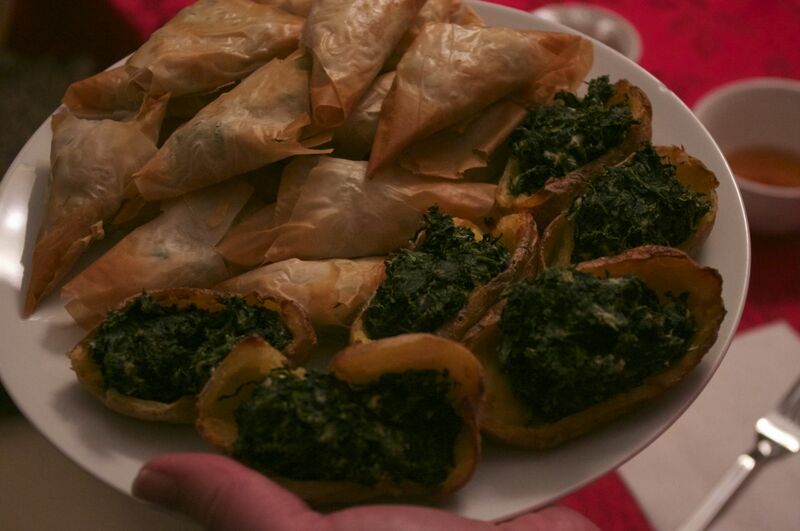 They’re both on the lighter side of things: the samosas are baked rather than deep-fried, and the potato skins are filled with spinach rather than melted cheese. Keep these healthy snack ideas in mind for your next gathering, or do what I did and serve them as the main dish for dinner. As an added bonus, if you make both of these at the same time, the potato that you scoop out of the skins can be used in the filling for the samosas. The recipe for the potato skins is here on the Weight Watchers site.These were really good, though I agree with many of the reviews that suggest adding a little onion or garlic, nutmeg or hot pepper. There’s a whole lot of spinach going on here! This recipe makes a ton of spinach filling. 20 oz is two boxes of frozen chopped spinach. The Yukon Gold potatoes I used were pretty small, and it took six of them (12 halves) to hold all of the filling. I added about 1/2 teaspoon of paprika to the filling. I used real bacon rather than turkey bacon, purely because I went for the convenience of precooked bacon. 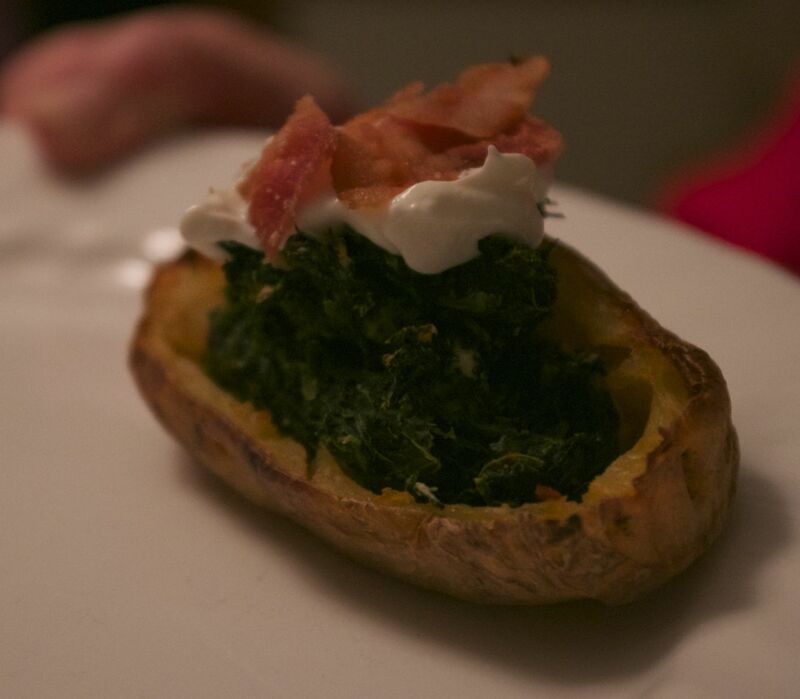 With a tiny bit of bacon on each potato half, I don’t think it makes a huge impact. Turkey or veggie bacon would be good, or you could skip it all together. OK, one more not-as-healthy change: these were really good with a little bit of sour cream (I used light) on top. Again, just a dab will do, and it adds nice flavor and moisture, as well as making it look more attractive. The recipe for samosas is from Cooking Light and you can find the recipe here. The phyllo bakes up nice and crunchy with just a brush of oil. Inside is a soft filling of potatoes, peas, and carrots, with fragrant Indian spices. I did not make the mint chutney; instead I made a dipping sauce from the New Moosewood Cookbook (recipe below). Mint chutney doesn’t sound like my kind of thing, and I’d made the dipping sauce before and knew that I liked it. As a side note, Moosewood’s recipe for samosas is also really good, but I love the addition of carrots in the Cooking Light recipe. Once you get the hang of folding the samosas, it’s not hard to do. I won’t tell you how long it took me to get the hang of it, though! Place all ingredients in a small saucepan and stir until the sugar dissolves. Heat to boiling, then simmer uncovered for about 10 minutes. It will reduce slightly, but this is a thin sauce. Serve warm or at room temperature with hot samosas. I suggest giving each person a small bowl of the dipping sauce so they can double-dip! I bought the cutest basket of nectarines at Trader Joe’s; six of them tucked into a plastic container covered with netting and a tag that said “ripen in the fruit bowl.” They did ripen nicely, but of course they were all ready to eat at the same time. I ate one and wanted to take advantage of the rest while they were fresh without feeling like I had to cram them down and force my husband to help me eat them. The solution? Nectarine frozen yogurt. It’s summer in a bowl; fresh and delicious with no worrying over rapidly ripening fruit. 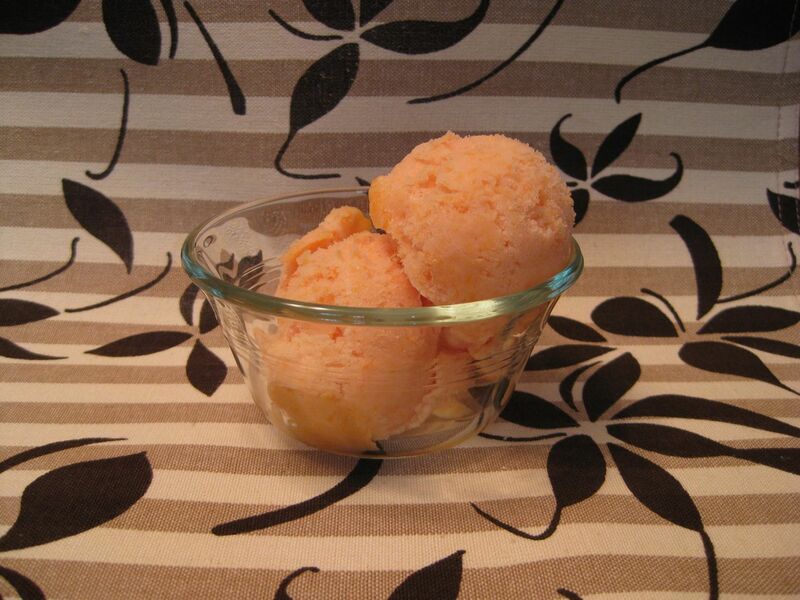 This is adapted from the Peach Frozen Yogurt recipe in David Lebovitz’s The Perfect Scoop, which is a fantastic book. I used nectarines instead of peaches and fat-free yogurt instead of whole milk yogurt. I also used an immersion blender to puree the fruit – so much easier than transferring it to a blender or food processor. No ice cream maker? Check out David Lebovitz’s method for making ice cream without a machine. I have not tried this myself, but have read many good reviews of this technique. When the nectarines are cool, add the yogurt and puree with an immersion blender until it is almost smooth but still has some chunks. If you don’t have an immersion blender, puree the mixture in a blender or food processor. Stir in the lemon juice. Freeze the mixture in your ice cream maker according to the manufacturer’s instructions. Just the other day, I realized that it’s August and I should be making some summer salads. In fact, for dinner tonight we’re having salmon and Whole Grain Salad, which is one of my favorites. As much as I like that salad, how about some variety? 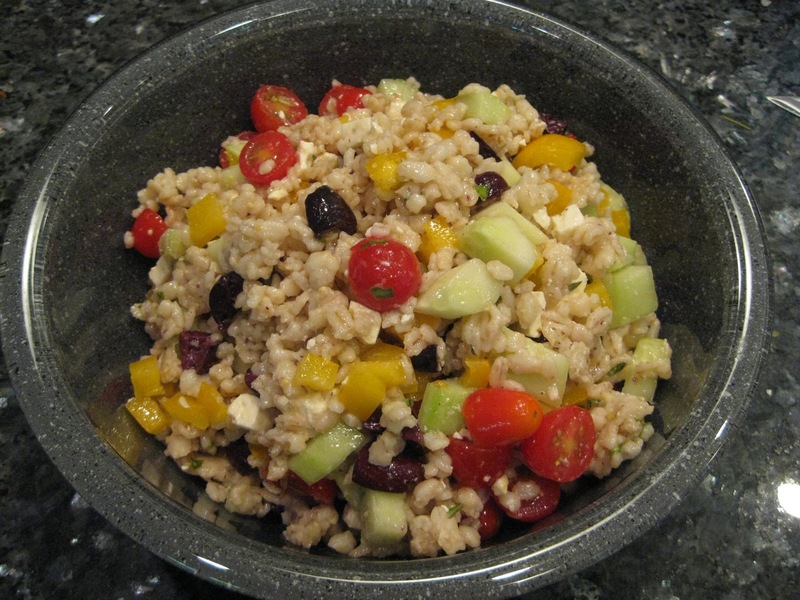 Enter Greek Barley Salad! Barley, veggies, kalamata olives, feta cheese, and a touch of lemon. Opa! I found this recipe in Cooking Light magazine. You can find it here, under the name Greek Chicken and Barley Salad. In the interest of clearing out my freezer, I cooked the barley in chicken broth, but it would be easy to make a vegetarian version with vegetable broth. I used quick-cooking barley instead of pearl barley. You are currently browsing the archives for the Healthy/Kind of Healthy category.